Montreal may have not yet been named Canada’s new Reggae Music Capital but the city located in the primarily French province of Canada has been known to bread great Reggae talents since the late 1970’s, also celebrating 10 years this summer of hosting the country’s largest International Reggae Festival. The Reggae scene in Montreal has been held down by great Reggae acts such as Jah Cutta, Mello G and 2008’s Juno winner Mikey Dangerous for quite some time, followed by quality producers like Subsonik (Dub Avenue) Records, Tim Dub and Dan Fiyah Beats. Currently while they still hold down our city, Dancehall artist Sampaloo made his International claim to fame last year with songs “Nah Run, Nuh Hide” and “Roll Out” amongst Reggae artists like Dan Fiyah Beats, Marky Lyrical, King Mee and Prophecy Izis who also reached the International market. With that being said, Marky Lyrical has stayed at the top of the charts on Canada’s Rebel Vibez program for the last couple of weeks creating a great buzz for the Montreal Reggae scene. 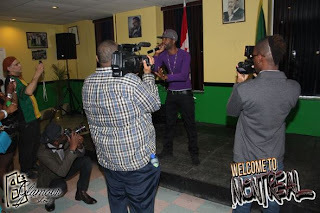 March 30th that passed, artist Sampaloo hosted his annual “Welcome to Montreal” featuring 14 Reggae and Dancehall acts from around Canada, 10 being from the city of Montreal. The crowd reached to 300 at its prime time, with 6 different Media outlets, including the Montreal Gazette, to support Montreal urban talent, which is something the artists have not seen in almost 5 years. Sampaloo continues representing for Montreal, releasing his new Reggae hit off Internationally known label “Tenement Yard Records” new riddim “Moonlight”, the song is titled: Journey a.k.a Life. The artists now in unity, continue to work at bringing more music and great performances for their Montreal fanbase, continuing on from Welcome to Montreal, Indie Rootz Records will be launching their Label at E.B Club Lounge this weekend again highlight Montreal and Canadian Reggae talents.